Price includes US shipping! Outside US add $3 per book. If you want to order online with a Visa or Mastercard, you can go directly to the VRG website. It is 2 am and you need a vegan donut - where do you turn??? Most of us are never going to become vegetarian nutrition experts, but it is likely that we will crave a donut. That's where this guide to the daily aspects of being a vegetarian is indispensable. 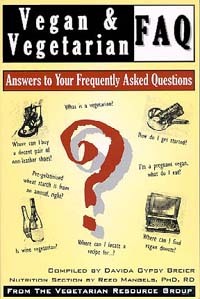 Based on answers given to some of the 100,000 visitors to The Vegetarian Resource Group website (www.vrg.org) every month, this guide addresses the many circumstances of living as a vegetarian. This book is the culmination of the many questions and frustrating lack of answers vegetarians routinely encounter. This guide will help non-vegetarians understand some of the issues and ingredients that concern vegetarians. It is also a wonderful starting place if you are a new vegetarian. And if you are a vegetarian 24 hours a day, 7 days a week, you need this book! Vegan & Vegetarian FAQ will make being a vegetarian even easier. You will find hundreds of answers on everything from vegan marshmallows to food ingredients to veggie kids to how to cook tofu. Weve also included 35 popular recipes, including fajitas, sloppy joes, and eggless banana pancakes, as well as sources for thousands more! Where can I find vegan marshmallows? Where can I find non-leather shoes? Is there one official symbol that denotes a vegetarian product? Can I be a vegan and an athlete? Do you know where I can find a vegetarian food pyramid? What can I do about the gas Ive experienced since I switched to a vegetarian diet? Why are some cheeses labeled as vegetarian cheese? Why wouldnt cheese be vegetarian? What is rennet? What is tofu? What do I do with it? Ive been vegan for a few months, but I really miss chocolate. Where can I find some dairy-free chocolate? What can I do about cooking on holidays? Thanksgiving? Passover? Christmas? Is there a guidebook to vegetarian restaurants available? Im going to Disneyland with my family. Will I be able to eat there? How do I get my kids to drink soymilk instead of cows milk? Whats this I hear about tofu making people senile? I am looking for a book or some information that might tell of some of the more hidden places animal products are use, such as film process ing, gelatin, and other things of this sort. But down doesnt involve killing the bird. Does it? Why is Wine So Fined?